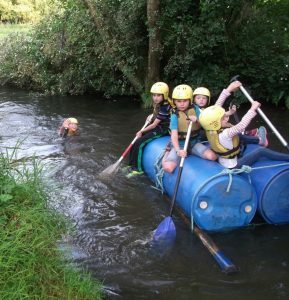 At the beginning of every school year, Year 5 and 6 go to Mill on the Brue. It is a fantastic opportunity to really get to know our new teachers and there are lots of fun activities like rifle shooting, zip wire, tunneling, leap of faith and raft building. We have written about some of them in more detail here. We all got 3 pellets each go and you got 3 goes. You had to lie on a damp mattress and there were 4 rifles, 2 with scopes and 2 without scopes. “It was so cool. 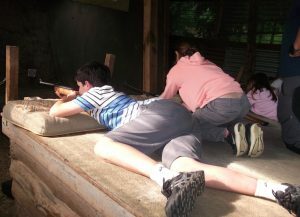 I found it challenging trying to get as close to the bulls eye as I could” said Reuben. 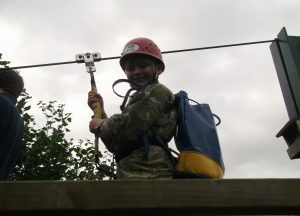 One of our favourite activities was by far the zip wire. This amazingly long run stretched across the entire activity centre, and was very fast!! Almost everyone had a brilliant time, and some people even conquered their fear of heights. 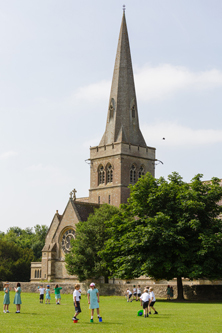 The zip wire is about 500 metres in length and took about 30 seconds to complete. Flying through the sky at approximately 30 miles an hour with a self-activated parachute was definitely very excitable, giving you adrenaline and a sense of awareness: what’s not to like?! As you can see, Mill on the Brue is a very exciting place and everyone enjoyed it.